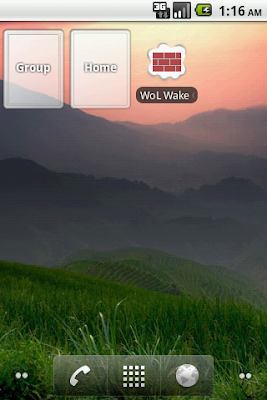 WoL Wake On Lan Wan is my newest Android Application. I was looking for a WoL app that wouldn't FC on me and would support any UDP port, IPs and Domain names, multiple packets, multiple profiles, one-click widgets... so I made my own. The application is robust, extremely flexible, and powerful. Want to know more about WoL? Have a Linksys Router you're having trouble configuring? Depicus is also a great source of information and tools. 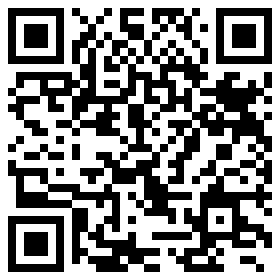 Check out the new help.benfinnigan.com forum for more help from other users and a direct line to the developer (*ahem* me). Profile Grouping - Want one widget for both your WiFi and WAN configurations for the same computer? Now you can group them and create a group widget that sends packets to all the computers in the group. Have a data center with loads of computers? Group them and wake up your entire data center with one touch. IP and Domain Support - Not everyone has a dedicated external IP for WoW and so they turn to dynamic DNS like dyndns.org to provide a fully-qualified domain name that resolves to their machine. On the other hand when using WoL on an intranet there's probably no need for domain name because the IP is fixed or known. UDP Ports 0-65535 - OK, I didn't test ALL of them but, I did test a non-standard port for my own implementation and it worked like a champ. Why limit a user to 7 or 9? You know what your firewall needs! Toggle Broadcast - With the ability to turn broadcast on for profiles to use while connected to WiFi and turn it off for profiles to use while connected to 3G/Edge/G etc WoL Wake on Lan Wan has you covered. Send Multiple Packets - It's UDP... meaning connectionless. Packets can lose their way sometimes in the internet, so sending a configurable number of packets at a configurable interval is a great way to make sure the message gets to the remote computer. This is also great for testing your router and machine configurations (I use a tool called Wake On Lan Monitor). One-Touch Widgets - Do I really have to open the application and pick a profile every time I want to wake up my computer? No! Of course not, we know how lazy... er.. busy you are so with One-Touch Widgets you can save your precious energy. This is also really handy if you have loads of profiles and frequently use one at the bottom of the list. Sorting - With a bunch of different profiles, it's nice to be able to see them alphabetically, or reverse alphabetically, or more recently changed - you get the idea. Localization - The application is now localized in French and Spanish... very poorly. If you would like to submit a change to some of the poorly localized UI feel free to email me or leave a comment on my blog here. Also, if we're not localized in the language that you're interested in please email me so that I can give you a list of strings to translate. CSV Export and Import - As wonderful and amazing as phones are, it sure is a pain to type on them. That's why with the new CSV export and import you can export a sample and then type a bunch of them in from a computer. Import the new CSV and voila no need to peck away on your phone for hours on end. For those of you who may be having trouble here is the order the columns should be in the CSV: Name, MAC, IP or Domain Name, UDP Port, Broadcast ("true" or "false"), Subnet Mask, Send Multiple ("true" or "false"), Packet Count, Interval (seconds). Also, please note that every column must be filled with a value. NO ADVERTISING - Seriously? For something as simple as a wake on lan app, no one wants to be bothered by ads. 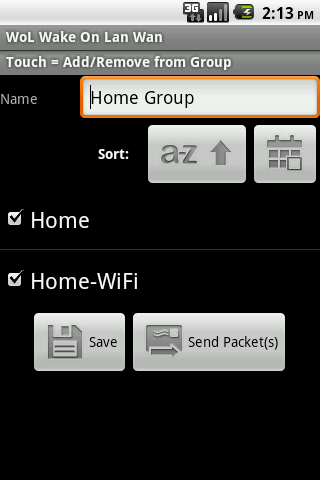 This is by far the best wake on lan app I've tried on android. Thanks i'm glad you like it. I agree with you, but of course i'm biased. The widget icon is a little ugly? :( Any chance you are working on a new one? It just doesn't fit in with my homescreen. I know, I know, I am a tool. Soong, I swapped it out for a plain-jane widget for now. Maybe I'll make a nice one someday, but I wouldn't hold my breath. So I'm trying to setup a WoL app to run via Tasker, and both the plugins I've found for it don't work. However, your app works great ( and is the best one I can find for WoL period ). However, it doesn't seem to have any way to be automated. Is there any specific DATA I can pass the app on startup to get it to execute my profile? What you need to do is put extended data in the intent. You need to add "CPATH" to the intent with a value of the full path to the .dat or .grp configuration you want to launch by calling putExtra on the intent. You also need to add WAKE to the intent with a value of true using putExtra on the intent. Feel free to "Email the developer" if you run into issues and I'll help you with it. That would be perfect. Please send me emails with original text and corrected text so we can improve the translation. My 3G carrier somehow block my attempts. Pedro, I currently have no plans to integrate with a third-party service. I think part of the appeal is that none of your MAC/Profile information is sent off to a third party. Please have a great year! I commented in the help forum of yours, in localization section. Please respond. My friend downloaded it on his Disire, but when I tried on my Wildfire I simply couldent find it exact same problem as Chris. Ben, tried the forum but your capcha is broken, no images appear. Anyway, is it just me or is there no longer a widget? I don't see a WOL item listed in my widget list. Am I dumb? I can confirm that it's still not possible to register on the forum. I have a feature request: option to for the widget to first enable wifi and wait for wifi connection, then after sending magic packet disable wifi. Excellent WOL application. I have been looking for a way to automatically wake my pc up at a certain time each day though. Is the only way to do this is with something like Tasker? can you add 'ping' to your app? To see host is alive or wake was successfull.. ?! I finally set the Tasker profile! What a fantastic app. Simple and easy to configure, yet comes packed with a ton of options. Widget, export feature...you thought of everything! Great work! Good app, but please also include so its possible to shut down the computer. This is just to sen one command. Hello. I have a problem with wol, I can usually connect the machines with the application, but after 5 minutes the pc is off you can not rewire the app. I've done tests on my computers and wol function of them are working properly. I believe q is some setting in the app. I have seen this happen with bad router settings. Sometimes the router won't send traffic to a particular port if it's not active (ie. sending packets outbound). You may want to check your router settings. Could you give me a hint on what settings should investigate? Hi, looks good, but cannot find any sort of help file. Specifically, what does 'secure on' mean, and what should be entered there? Cheers, Don.